VERSATILE with REMOVABLE ORGANIZER INSERTS – Customize your caddy to your specific needs. Our inserts attach with Velcro so they are easy to assemble and remove. Use the inserts for holding diapers and wipes, or remove them for storing larger items like blankets, toys, books etc. Perfectly sized at 13 x 9 x 7 ” with 8 outside pockets. As parents we know that changing diapers is hard enough without constantly having to search for the supplies! (Is our baby the only one who acts like getting his diaper changed is the end of the world?) 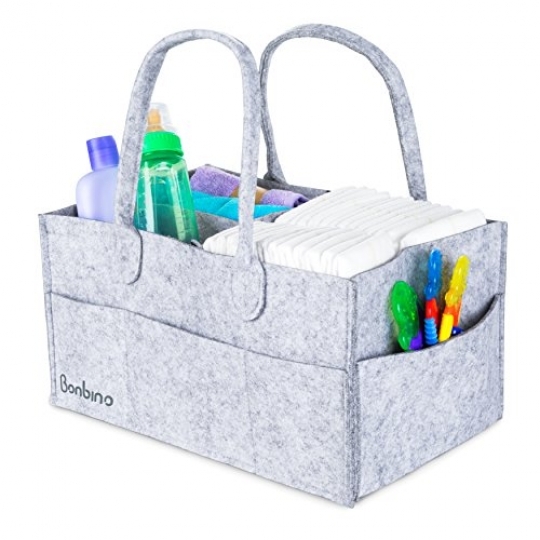 The Bonbino diaper storage caddy will simplify diaper changing by making it easy to have everything you need right at your fingertips. Clean up that changing station for good! The basket will firmly hold a baby wipes container, and has pockets for diapers, ointments, burp cloths and swabs. Forget having to run upstairs every time your baby needs to be changed – keep your diapers, wipes and other supplies portable and easily accessible in this sturdy felt storage bag. With handles, 8 pockets, and removable inserts, it’s everything you could want in a caddy – plus it’s machine washable. Keep everything you need to care for your baby in one well-organized place. At a moment's notice or a baby's cry, take everything you need to care for baby from one room to the next. We all want to be more organized and diapers aren’t the only thing this storage caddy is good for. Use it to organize your car, bathroom, crafts, pet supplies etc. Its versatility is only limited by your imagination. Click the Add to Cart button now to begin organizing and simplifying your life! ORGANIZE AND SIMPLIFY- The Bonbino Caddy can hold almost anything you need for your baby in one portable, well-organized place. With 8 OUTSIDE POCKETS, this 13 x 9 x 7″ caddy organizer is perfect for storing and organizing all your baby supplies. Conveniently store diapers, wipes, burp cloths, diaper cream, baby powder, lotion, wash clothes, nail clippers, combs, q-tips, thermometer­ – you name it! SATISFACTION GUARANTEE – At Bonbino we are parents who want to make caring for kids a bit easier by providing high quality products. We are confident you will love our product, but if you are not satisfied with the Caddy Organiser, let us know and we'll happily refund your money within 60 days.